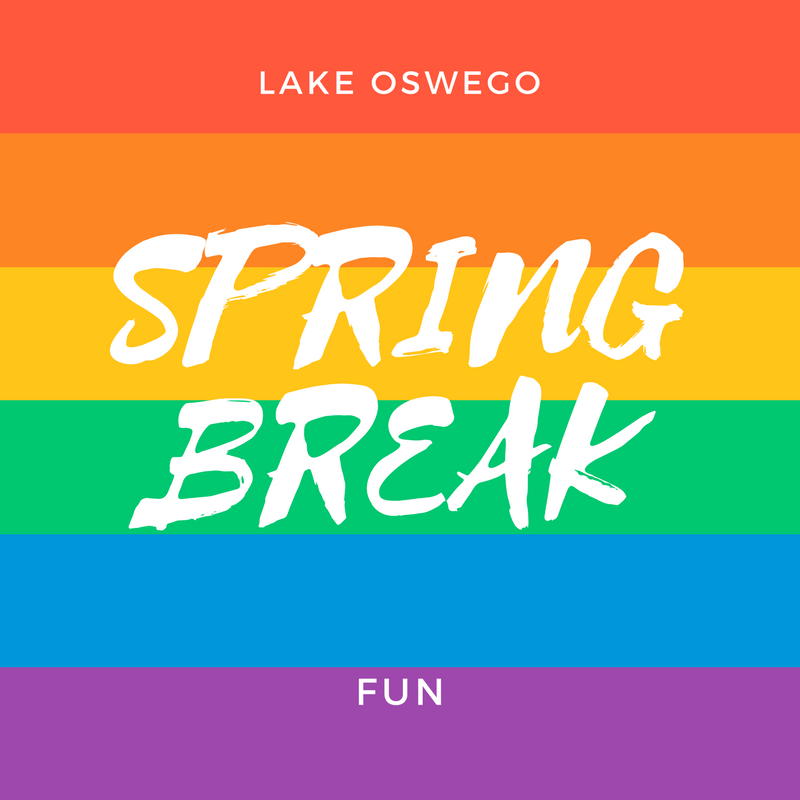 If you’re looking for something for your kids to do during Spring Break this year in Lake Oswego, you’ve got lots of options. Check out these offerings and then sign up as soon as you can. Space is limited in some cases. COMMUNITY SCHOOL. Register on their website. ■Lifeguard Training Class for ages 15+. Get your teenager ready for summertime jobs with classroom and water sessions. Passage of initial swim test required to enroll. Swim test: Saturday, March 25 from 5:30 p.m. to 6:30 p.m. Class: Monday, March 27 through Tuesday, March 28 from 2:30 p.m. to 6:30 p.m. and Wednesday, March 29 through Friday, March 31 from 10:00 a.m. to 6:30 p.m. Oswego School District pool, 2455 Country Club Road. Fee: $230. Call 503.740.7184 for more information. ■Lifeguard Review for ages 17+. If you or your teen are already certified and just need a refresher course, this is it. Online and classroom learning and water sessions. Passage of swim test required. Monday, March 27 through Tuesday, March 28 from 9:00 a.m. to 2:30 p.m. Lake Oswego School District pool, 2455 Country Club Road. Fee: $103. Call 503.740.7184 for more information. ■Basketball Camp for Boys and Girls in Grades 3-9. Learn the fundamentals through drills, practice time with coaches and games. Led by Lake Oswego head boys’ basketball coach, Marshall Cho. Monday, March 27 through Friday, March 31 from 9:00 a.m. to 3:00 p.m. Lake Oswego High School Gym, 2501 SW Country Club Road. Fee: $205. LAKE OSWEGO PARKS AND RECREATION. Many of these camps have an AM or PM session but the Parks and Recreation Department now offers “in-between care” for participants who want to stay at Palisades during lunchtime. Cost is $25 for the week. Select optional camp pricing when you register or call 503.675.2549. Register on their website. ■Ninjaneering using LEGO® for ages 5-7. Let your kids immerse themselves in the world of Ninjago while they build unique and fun LEGO projects. Monday, March 27 through Friday, March 31 from 9:00 a.m. to 12:00 p.m. at Palisades, 1500 Greentree Road. Fee for Course #14861: $55/Resident; $178/Non-Resident. ■Jedi Master Engineering Using LEGO® for ages 8-12. Calling all young Jedi who want to learn how things like gear trains and worm drives can help them build LEGO Pod Racers, AT-AT Walkers and more. Monday, March 27 through Friday, March 31 from 1:00 p.m. to 4:00 p.m. at Palisades, 1500 Greentree Road. Fee for Course #14862: $155/Resident; $178/Non-Resident. ■All About That Bass for ages 8-12. Kids get hands-on experience with the electric bass, upright bass, and other lower pitched instruments while learning their role in jazz and classical music. Monday, March 27 through Friday, March 2531 from 9:00 a.m. to 12:00 p.m. at Palisades, 1500 Greentree Road. Fee for Course #14863: $140/Resident; $161/Non-Resident. ■Beginning to Rock Camp for ages 5-7. Consider this a rock immersion course for youngsters as RMC staff introduce them to the tools of the trade: bass, drums, guitar, keyboard and vocals as well as music fundamentals: pitch, harmony and rhythm. Monday, March 27 through Friday, March 31 from 1:00 p.m. to 4:00 p.m. at Palisades, 1500 Greentree Road. Fee for Course #14864: $140/Resident; $161/Non-Resident. ■The Gaming Academy for ages 10-15. Designed for the Future Game Builders of America. Students will get hands-on experience designing and building their very own games through a combination of Video Game Design, Advanced Game Design and 3D Game Design. Monday, March 27 through Thursday, March 30 from 9:00 a.m. to 4:00 p.m. at Palisades, 1500 Greentree Road. Fee for Course #14865: $310/Resident; $357/Non-Resident. ■Spring Break Farm Camp for ages 5-12. Luscher Farm is home base while campers learn about organic gardening, seed starts, and how to plant vegetables. Other activities include farm based crafts and feeding the chickens. Monday, March 27 through Friday, March 31 from 9:00 a.m. to 1:00 p.m. at Luscher Farm, 125 Rosemont Road. Fee for Course #14686: $155/Resident; $178/Non-Resident. ■Junior Golf Camp for ages 6-17 gives kids a chance to brush up on their game with lessons, activities, and practice. Lunch included. Tuesday, March 28 through Friday, March 31 from 10:00 a.m. to 1:00 p.m. at the Lake Oswego Public Golf Course, 17525 Stafford Road in Lake Oswego. Fee for Course #14741: $149/Resident; $175 Non-Resident. ■Intro to Survival Camp for ages 6-9. Kids put down the gadgets and learn to use their own wits like teamwork and decision-making when presented with scenarios typically seen on popular TV shows. Monday, March 27 through Friday, March 31 from 8:30 a.m. to 1:30 p.m. at George Rogers Park, 611 S. State Street. Fee for Course #15102: $215/Resident; $248/Non-Resident. ■Intro to Fencing for ages 7-12. Learn the basic skills of the Olympic sport of fencing with an emphasis on quick thinking, coordination, strength and agility. Equipment provided. Tuesday, March 28 through Thursday, March 30 from 9:00 a.m. to 12:00 p.m. Palisades, 1500 Greentree Road. Fee for Course #15127: $98/Resident; $123/Non-Resident. ■Mini Art Masters. This interactive camp will introduce kids to the techniques of some of the greats like Monet, Matisse, Picasso and Van Gogh. Call for dates as currently dates are listed for March 20 through March 24 but I’m assuming that is a misprint. When I called I was told that the attendant would check with her manager to correct it but it still was not corrected by posting time. 9:30 a.m. to 1:00 p.m. Sibling discounts as well as extended day options. 1-2 year olds from 9:30 a.m. to 1:00 p.m. Fee: $45 for half day; $70 for full day until 3:30. 3-12 year olds from 9:30 a.m. to 1:00 p.m. Fee: $35 for half day/$160 for the week; $50 for full day until 3:30/$225 for the week. NIC & FIGS. 425 Second Street. 503.479.8596. Register on their website. ■Me and My American Girl Doll Camp for ages 8 and up. Supplies and instruction are included so your American Girl Doll fan can sew matching skirts or pajama bottoms as well as tote bags for her and her doll. Monday, March 27 through Wednesday, March 29 from 10:00 a.m. to 12:00 p.m. $132. ■I Love My Dog. Dog lovers will be delighted with this camp’s lineup: Make a drawstring doggie backpack on day one. Bake dog treats and human treats on day two. Sew a leash and bandana on day three. Monday, March 27 through Wednesday, March 29 from 1:30 p.m. to 4:00 p.m. $140. ■Felting Fun. Kids learn the many ways to be creative with felt: needle felt an animal of their choice, felt a picture on a hoop and wet felting to create a naturally exfoliating soap. They can take home a needle felting kit so they can make more creations on their own. Monday, March 27 through Wednesday, March 29 from 12:30 p.m. to 3:00 p.m. $148. ■Salt Water Taffy for ages 10 and up. Make taffy from scratch including the stretching, pulling and wrapping part. Then take some home for the family to enjoy. Wednesday, March 29 from 10:00 a.m. to 12:30 p.m. $52. ■Bagels! for ages 6 and up. Students will learn to mix, proof, shape, boil, and bake their very own bagels and then create flavorful cream cheeses to spread on top. Wednesday, March 29 from 1:15 p.m. to 3:45 p.m. $48. ■Donut Pillow for ages 8 and up. This is a perfect beginner friendly sewing class where students will make a donut pillow complete with sprinkles. Thursday, March 30 from 10:00 a.m. to 12:30 p.m. $52. ■Let’s Make (and eat) Donuts for ages 6 and up. Make it a donut-kind-of-day by signing your child up for this donut-themed afternoon class following the pillow making session. Kids will make, frost, decorate, eat, and take home donuts! Thursday, March 30 from 1:00 p.m. to 3:00 p.m. $44. ■Make and Take Pasta and Sauce for ages 6 and up. Let the kids make dinner tonight. They will make fresh pasta as well as pesto and marinara sauce and bring home one pound of pasta for everyone to enjoy. Friday, March 31 from 10:00 a.m. to 1:00 p.m. $62. ■May the Felt Be With You. Needle felters will take home their favorite Star Wars character that they’ve created along with a take home needle felting kit so they can add to their collection at home. Friday, March 31 from 10:00 a.m. to 12:30 p.m. $48. ■Spring Break Mixology for ages 21 and over. After a week home with the kids, you might need a drink! Learn the art of a few basic cocktails and enjoy a tasting journey led by one of Portland’s most popular cocktail artists. Friday, March 31 from 7:00 p.m. to 9:00 p.m. $65. ■Spring Break Camp for ages 5-12 from 7:30 a.m. to 6:00 p.m. on Monday, March 27 through Friday, March 31 includes sports, swimming and pool activities, arts and crafts, games and more at Mountain Park Clubhouse, Mt. Jefferson Terrace. Full Week Fee: $250/ Mt. Park members; $300/non-members (discount for siblings). Full Day Fee: $55/members; $65/non-members (sibling discount). Register at front desk. This entry was posted in Things to Do in Lake Oswego and tagged Lake Oswego Oregon, Spring Break, Spring Break Camps. Bookmark the permalink.